"The Renal System at a Glance", provides a concise and accessible introduction and revision aid for medical students. Following the familiar, easy-to-use at a Glance format, each topic is presented as a double-page spread with key facts accompanied by diagrams encapsulating essential knowledge. 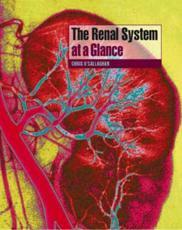 This new edition of "The Renal System at a Glance": contains a second colour throughout to enhance the visual appeal; provides a fascinating introduction to modern science and clinical nephrology; has been thoroughly revised and updated to contain the latest molecular and physiological developments; and includes a new chapter on pregnancy and the kidney. "The Renal System at a Glance", formerly "The Kidney at a Glance" will appeal to all medical students, junior doctors on Foundation Programmes and for those revising for final exams. The book is also suitable for those training in allied health professions, including specialist nurses working on dialysis wards. Reviews of the last edition: "...this book is an ingenious hybrid of a renal physiology/pharmacology text, and a nephrology text. Definitely a worthwhile investment for first years." - GKT Gazette.